The November 2018 election is coming up, and more women than ever are running for Congress. In our She’s Running series, HelloGiggles is highlighting some of the young, progressive women candidates who are reshaping the face of politics just by campaigning—and could have a hand in reshaping our future. Still need to register to vote? Do it here. Debbie Mucarsel-Powell, born in Ecuador, immigrated to the U.S. as a teenager with her mother and three sisters seeking the “American Dream.” Now, she’s in the running for a seat in Congress. At the top of her list? Tackling gun violence, immigration reform, climate change, affordable health care, supporting women’s rights and representation in politics, and ensuring all working families have the opportunity to get ahead in the U.S.
Before the highs, though, she went through her fair share of lows. At age 24, Mucarsel-Powell lost her father to gun violence, so that issue hits close to home. “He never walked me down the aisle. My children never met their grandfather. My sisters and I never had the chance to say goodbye,” Mucarsel-Powell recounted in an advertisement that ran during the nationwide March for Our Lives demonstrations earlier this year in March. In addition to opening up about her personal experience with gun violence, Mucarsel-Powell is adamant about the ways she wants us as a country, and elected officials in Washington D.C., to not only think about gun violence but actually take the necessary steps toward gun reform. With Florida’s primary elections around the corner on August 28th, Mucarsel-Powell continues to dedicate her campaign and career to improving the lives of the people in her community. Now, it’s only a matter of time until we know whether she’ll join Alexandria Ocasio-Cortez, Stacey Abrams, Deb Haaland, Sharice Davids, and other women in fighting for change and making history. Regardless of the outcome, she’s in great company with other women of color who are putting themselves out there and advocating for real change, like Kerri Evelyn Harris, a Democratic Senate candidate in Delaware, and Fayrouz Saad, who ran in Michigan’s 11th Congressional District. We asked Mucarsel-Powell about what inspired her to run for Congress, the issues she wants to tackle if elected, what it means to run for Congress as a Latina immigrant, and any advice she has for young women of color who want to become involved in politics. 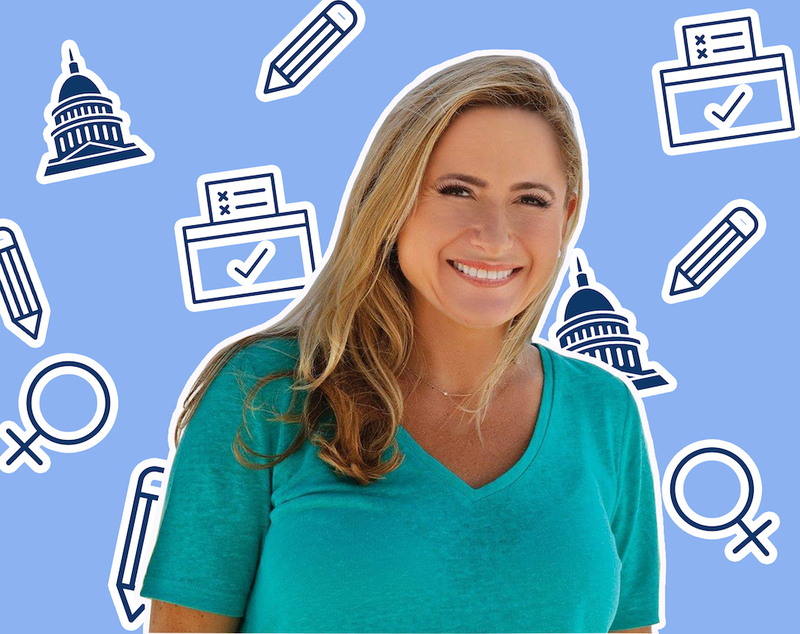 HelloGiggles: You’re a 2018 Democratic candidate seeking election to the U.S. House to represent the 26th Congressional District of Florida—what inspired you to run for Congress? Debbie Mucarsel-Powell: I was raised by a single mother who brought us [to the U.S.] looking for better opportunities for us and for herself—we didn’t have anything when we got here, and I started working at the age of 15. I’m very grateful for the opportunities [this country has given me], but I see those same opportunities really slipping away for so many families in my community and across the U.S.
I’ve worked in health care and education, I was the associate dean at Florida International University medical school, where I was part of a team that funded a program called “The Neighborhood Help,” where we brought medical students through mobile clinics to vulnerable areas here in Miami to provide primary care. As we were doing all of this, after Donald Trump was elected in 2016, I was also watching what Congress was doing. I realized Congress was doing nothing, but worse than that, they were making it harder for people in my community to [speak up]. So when U.S. Representative Carlos Curbelo voted to repeal the Affordable Care Act—in that moment, when I saw how arrogant he was to turn his back to his community, to take away all care for more than 100,00 people—that was the moment I knew I had to step in. That was the day I made the decision to run for Congress. HG: August 2nd marked the launch of your campaign one year ago in 2017. In the past year, you said you’ve worked to help victims of Hurricane Irma, stood up against the NRA and for gun reform after the Parkland shooting, and helped fight against immigrant detention at the border. How do you plan on not only continuing to shed light on these issues but also, if elected to Congress, how do you plan on influencing and pressuring other government leaders to take action? DMP: There are different issues that are so important right now for our community here, but also across the country. One of them is gun reform. I lost my father to gun violence when I was 24, I was getting my Master’s degree at the time, and that experience really changed me. It’s an issue that’s so personal and that has gotten so—it has become an epidemic. Every single day that passes that we don’t take action, or that the government doesn’t take action, is another day where a child can lose their life or a loved one can lose someone to gun violence. And because it’s such a personal issue, it’s something that I’m not going to let go, and I will continue to put a lot of pressure once I get into D.C. to take action immediately. I also feel confident that if we elect the majority in the House, that we can actually get something done as it pertains to gun reform. I suspect that if people are involved, if people are engaged, the pressure for the Senate, regardless of whether we get a majority vote or not, will be so strong that we will be able to get something done. In terms of immigration, I’m outraged at the fact that people aren’t talking about children that are still being detained in these detention centers, and so any opportunity that I have to bring that up, like right now, is important so you can cover it. Post about it on social media. I talk about it when I’m in front of groups, for example, I’m going to an event right now and I’m constantly bringing light to this issue because right now, there is no course of action to reunite these kids with their parents. I was reading an article recently where it seems like there were allegations of sexual abuse to some of the children that were being detained, and I mean, we need to do something now. How can we live in a country where we’re allowing this to happen? We have to do something now. And I will continue to talk about it and bring light to these issues as much as I can and in any opportunity that I can. But one thing that I do want to say is that it takes all of us in order to make a change, together. As long as people are engaged, and people call and people march, we will be able to get our country back on track. I do believe that. But we can’t be complacent, we can’t think there’s going to be a blue wave and that it’s going to take us there. People need to be active, calling, marching, volunteering, contributing—whatever it is that they can do. HG: You’re running to flip a seat in Congress from red to blue. What does that mean to you in terms of shifting the narrative in Washington D.C. and beyond? DMP: What that means right now is that the “blue” seat is actually being held by a Republican. In my district, Hillary Clinton won by 60 points, so it’s actually the bluest seat in the country right now held by a Republican. So it’ll send a very strong message that people are ready for change and that people are ready to put people in office that are going to be representing the community and its values. And when I win in November, I am hoping that this seat will be another example like we’ve seen in other special elections across the country that people are engaged, they are paying attention, and they’re putting people that are going to represent them and not special interests or corporate donors. HG: You immigrated to the U.S. as a young girl with your mother and three sisters seeking a better life and economic opportunity—much like what many families detained at the border are/were hoping to attain as well. As someone who has gone through similar experiences like that firsthand, how are you working to debunk many of the misconceptions that people in this country have about the immigrant experience and the reasons why these families leave their home countries for the U.S.? DMP: You know, only in a country like ours does an immigrant like myself get to a point where I can run for Congress in one of the most contested races and have a very strong possibility of winning. And it’s a testament to who we are as a nation. We can’t lose that track and we can’t lose our values as Americans. This president ran on criminalizing immigrants and instilling fear in Americans that immigrants are criminals, that we want to take people’s jobs away, that we will commit heinous crimes. And the reality is, it’s just not true. Immigrants who come here are coming to the U.S. because they’re fleeing violence in their own countries, and they’re looking for an opportunity to just make it for their kids. My community relies heavily on immigrants. Half the people who live in Miami today were born in a different country. And they are our teachers, our nurses, our doctors, and so we have to stop criminalizing immigrants and understand that we are a country that was built by immigrants. And we are all immigrants. I mean, whether you’re a first, second, or third generation of immigrants, that’s who we are as a country. That is why it’s so important to get involved right now and elect the right officials that are going to actually work on issues like bringing wages up, protecting women’s health care choices, bringing money to education, instead of focusing on criminalizing a group of people that have come here, contributed to this country, and helped shape it into what it is right now. HG: The 26th Congressional District of Florida is south of Parkland, Florida where the shooting at Marjory Stoneman Douglas High School occurred, and as someone who’s clearly outspoken about gun violence and reform, what policies do you want to enforce in regards to this issue? DMP: Most Americans agree that we need to start taking action immediately, and the first thing we can do is pass universal background checks. There’s no reason why someone who’s on a terrorist watch list should be able to purchase a gun. Period. This has nothing to do with the Second Amendment—I completely respect the Constitution, no one is trying to change the Constitution, and I think that the NRA has been very effective in controlling that message, and it’s just not true. Ultimately, universal background checks should have been implemented years ago, and I can tell you that the person I’m running against voted against that. Voted against universal background checks and has taken thousands of dollars from the NRA. Another thing that I feel very strongly about is banning semi-automatic weapons and military-style weapons. There’s no reason why regular citizens, someone who’s not from law enforcement, can walk in and purchase an AR-15. That’s ridiculous. Those arms were created to kill a large number of people in a very short period of time. They’re weapons of war, they should not be on the streets. There are also a lot of programs that really need funding because a lot of kids are dying right now in this country simply by accident because people don’t have the information they needed to keep their guns out of kids’ hands. HG: In 2016, you were the Democratic candidate for District 39 of the Florida State Senate, but lost the election. How did that campaign go and what have you learned since then that you’re putting into action this time around? DMP: I have always been active and involved in matters of politics and education. I studied political science in college and received a Master’s in Political Economy. I also dedicated my career to working with nonprofits and to working at FIU Medical School. So I’ve had my share of dealing with elected officials. What I continued to see was that elected officials in government positions were making it harder for these nonprofit organizations to do what they had to do. When I first filed to run in 2016, it was to run for the Senate against someone who was making severe budgets cuts to education. I filed for candidacy late, and I only had about three months to campaign, but that was still a really important experience. Even though I had been active in politics, I didn’t completely understand the politics of the different communities that are part of this district. Time is definitely always going to be helpful when you run because you need to establish close relationships with people that live in your community so that they understand who you are, what you stand for, and what you’re going to do. Campaigning is not easy, and you really do need to earn people’s trust, you need to earn their votes, and I am very grateful that I’ve had more time to do that this time around. HG: Aside from gun violence and immigration reform, you’ve also done work with the Coral Restoration Foundation to protect our coasts and continue to mobilize the fight against climate change. How will you continue to champion for climate change if elected to Congress? DMP: I don’t know if you have seen some of the images that are coming out of Florida. They’re really terrible. We’re losing a lot of fish, thousands of fish, turtles, and manatees are dying—it’s really horrific. There’s toxic algae that’s coming out of Lake Okeechobee, and it’s partly due to that we don’t have strong regulations that protect the water quality down here in Florida. So I want to work to protect the Clean Water Act, which right now what they’re doing is easing those protections so that companies can actually get away with higher levels of contamination in the water, and that’s completely unacceptable. We need to make sure we enforce those regulations. HG: As a Latina immigrant running for Congress in 2018, what words of encouragement or advice would you give to other young women of color or youth who are interested in pursuing a career in politics? DMP: I’m getting a little emotional. I want to make it very clear to any woman out there that anything is possible. Whatever it is that you’re determined to do, that you’re dreaming of doing, that you want to do—that you can do that. It’s not easy, it takes a lot of work and unfortunately for women of color, it takes twice as much work to get support and to feel that the community will validate the work that you’re doing, but that’s okay. We are ready to do that work. It’s nothing new for us. Hopefully, along with other women like me who are running in this cycle, we’re paving the way for the next generation of Latina women and women of color that choose to make a change in our country. Hopefully, our representation is going to grow in this election cycle and in the next, and we won’t have to have these conversations about lack of representation in politics. We should have equal representation and that’s a goal I think we should all have.